At the end of 2012 our colleagues Montserrat Serra and Blanca Thiebaut were still being held hostage after their abduction from a refugee camp in Dadaab, Kenya on 13 October 2011. This is one of the longest-running kidnappings in the history of Médecins Sans Frontières (MSF). Insecurity has had a significant impact on our activities this year, and many teams continued to work in unpredictable and unstable situations. Seven MSF staff were detained in Myanmar in June, and two of them remain in detention. Two members of staff were kidnapped in North Kivu, in the Democratic Republic of Congo (DRC) in April. Several hours later, they were released unharmed. Armed men entered Huth health centre, in Yemen, and threatened MSF staff. In Somalia, Daynile hospital, on the outskirts of Mogadishu, was damaged by shellfire. We have not always been able to respond to people’s needs as we intended. In Syria, conflict intensified. Extreme violence, the collapse of the health infrastructure and the displacement of millions of people led to massive needs, but MSF has been frustrated at serious blockages to providing care. According to authorities, by early 2013, 57 per cent of public hospitals in Syria had been damaged, but lack of authorisation from the government, limited cross-border access and the severe constraints caused by insecurity have all restricted the provision of humanitarian assistance. Beginning with donations of drugs and medical supplies, our teams managed to expand activities over the year, setting up hospitals in Aleppo and Idlib governorates. But we have been forced to limit activities to opposition-controlled areas of the country and neighbouring countries. We are concerned about what the constraints on humanitarian assistance will mean for the people of Syria in the future. In eastern DRC, MSF continued working in hospitals, health centres and clinics across North and South Kivu, Orientale and Katanga provinces, despite escalating violence. In this country where health needs are extreme even where the context is stable, our programmes include basic as well as specialist medical services, mental healthcare and assistance to victims of sexual violence. We carried out 1.6 million outpatient consultations, adapting activities as people were forced to move in search of safety. Conflict in northern Mali and the warring parties’ restrictions on movement made it very difficult for people to get to health facilities. 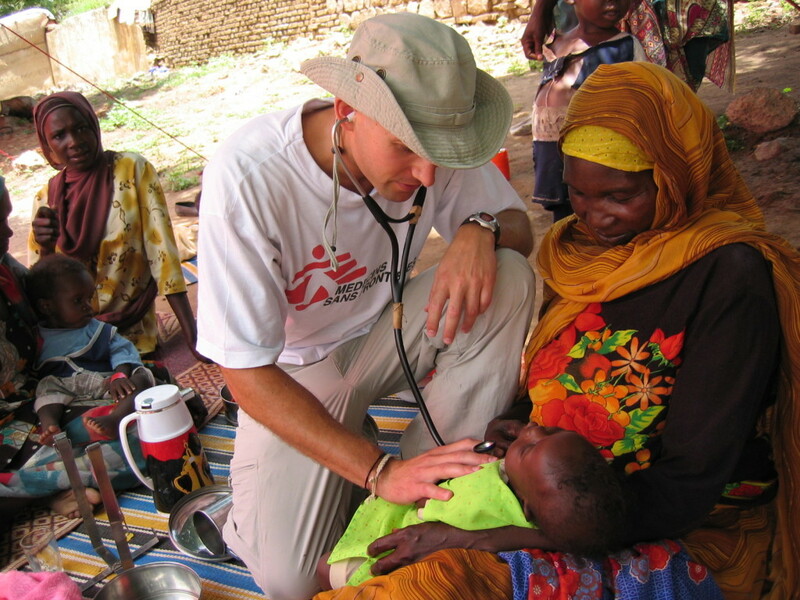 In an effort to improve access to treatment, MSF supported hospitals and health centres in remote locations as well as urban areas such as the city of Timbuktu. In March, MSF opened a maternity hospital in Khost, Afghanistan, a province that borders Pakistan and the highly volatile tribal areas. Some 100 births were being assisted per week, but then in April the hospital was targeted in a bomb attack, and seven people were wounded. We suspended activities. Several months of talks and assurances of support resulted in the reopening of the hospital at the end of the year. Attacks on health workers and health facilities and the lack of respect for medical action are having consequences that reach far beyond the direct victims. At MSF, we are collecting data on these attacks in order to assess their impact. This analysis will increase awareness of the need to respect medical activity, and it is hoped, help us to develop effective responses. In 2012, MSF saw huge growth in the need for support for people forced to leave their homes. Unfortunately, we also saw a slow and piecemeal response to that need. The crises of the past year have revealed that we must get the balance of assistance right: between the delivery of humanitarian relief and more specialised medical services. Fighting in Sudan led to a serious refugee crisis in South Sudan, with 170,000 people fleeing across the border. MSF set up field hospitals, clinics and feeding centres, carrying out more than 8,000 consultations each week. But the impact of healthcare is limited in the absence of essentials such as water, food and shelter, and in view of the needs and lack of broader response we realise that we should have done more to meet basic needs. Syrians who had fled to neighbouring countries also lacked access to the basics. As winter approached, refugees were still in shelters without heating. Fuel was hard to obtain. Half the refugees in Lebanon were not receiving the healthcare they needed. MSF ran assistance programmes in Lebanon, Turkey, Jordan and Iraq, but had grave concerns about the conditions for the 2.5 million people estimated to be displaced within Syria, to whom access was restricted. Even in Dadaab, Kenya, where the refugee population is the size of a big city and there are adults who have lived their entire lives in the camps, agencies and organisations have not been able to adapt to a rapidly changing situation, and this has consequences for morbidity and mortality rates. We have taken lessons from the challenges of this year, as we do from every new setting in which we work, to improve our response. Typhoons in the Philippines caused flooding on several different occasions over the year, and MSF delivered emergency assistance, supplying relief items and providing medical care. Similar activities were carried out when major flooding hit northern Cameroon and eastern Nigeria. Teams set up mobile clinics, built latrines and provided safe drinking water when the Pakistani province of Balochistan and southeastern parts of Sudan were severely flooded. We need to constantly consider whether our care results in the best outcomes for people, whatever the setting. Take maternal health: most maternal deaths occur just before, during or after delivery, and are caused by complications that often cannot be predicted. But skilled birth attendants can prevent some 80 per cent of maternal deaths. High-quality emergency obstetric services, postnatal services and aftercare for unsafe abortions are all critical to bringing down maternal mortality. Concerned at the lack of recognition of the importance of such services, MSF has engaged more in the provision of emergency obstetric care. Our teams assisted some 185,000 births in 2012, and around one in ten of these were by caesarean section. Our approach to HIV is changing too. In KwaZulu-Natal, South Africa, we are focusing on getting more people tested, initiating treatment earlier and making sure patients can access treatment and care close to home. The aim of models such as the decentralisation of treatment and care (including diagnostics) is to maximise the impact on patients’ health, as well as reduce the spread of the virus, since treatment significantly lowers the risk of transmission. Our team in Swaziland is improving lab facilities and capacity in local clinics in preparation for the implementation of a similar ‘test and treat’ approach, but there are many more challenges for us to address. Paediatric HIV, co-infection with other diseases, opportunistic infections, the abandonment of people with HIV in places where prevalence is considered ‘not so high’: these issues are invisible in wealthy countries, but require urgent attention in the places where we work. Despite progress in reducing mortality from malaria, 660,000 people still die from the disease every year, most of them African children. In Koutiala, Mali, and Moissala, Chad, areas where the disease is hyperendemic, MSF introduced chemoprevention during the peak malaria season. Teams systematically administered antimalarial treatment to children between three months and five years of age. The number of simple malaria cases treated in the following weeks fell sharply: by 66 per cent in Koutiala and 78 per cent in Moissala. This is a positive step, but the lethal impact of malaria means that addressing it must remain a priority. Strains of malaria that are resistant to current medication are already a concern in southeast Asia, and there are to date no real alternative treatment options. MSF is looking at how new programmes can tackle drug-resistant malaria. Drug resistance has already reached crisis point for tuberculosis (TB). Data on the prevalence of drug-resistant TB (DR-TB) have shocked doctors tackling the disease: in Uzbekistan, 65 per cent of MSF’s TB patients were found to have DR-TB. But since only a minority of patients have access to testing for resistance, this is just the tip of the iceberg. The introduction of a test that can detect resistance has nearly quadrupled diagnoses of DR-TB in just one MSF programme in Zimbabwe. For the 20 per cent of people with DR-TB who have access to treatment, what follows is two gruelling years of taking pills and injections, with severe side effects. Treatment is so harsh that some choose to stop, accepting what they know will be a death sentence. This is an emergency. Hundreds of thousands of people urgently need better diagnostics. They need treatment regimens that are effective, take less time and are not toxic. The ‘Decade of Vaccines’ – a collaboration including the WHO, UNICEF and private foundations – was launched in 2010, but two years later the number of children who have not received the basic package of immunisations has actually grown, from 19 to 22.4 million. Large sums are being invested in vaccines, yet the impact is not obvious. Hundreds of thousands of children are still dying from preventable diseases every year. Children living where roads are poor, where there is no electricity or where there is insecurity, are all at risk of missing out on immunisation. This is because most vaccines must be kept refrigerated from production to administration, need more than one dose, and require a skilled health worker to administer those doses. These constraints make it very difficult to reach remote populations. Vaccine funding must be invested in making vaccine programmes work: in developing new technologies and simpler tools, adapting delivery and cutting costs. Ultimately, our objective is, as always, to enable access to medical attention to everyone who needs it, no matter who or where they are. Our frustrations with the limitations of the medicines and tools available, and the limitations of access and response, do not stop us. Thanks to the ongoing support of millions of people around the world, our independence and impartiality have allowed us to bring important assistance to people in crisis. We continue to strive to improve that assistance. Older: Does a child die of hunger every 10 seconds?